Kids can create bright and boo-worthy monsters with this colorful block kit. 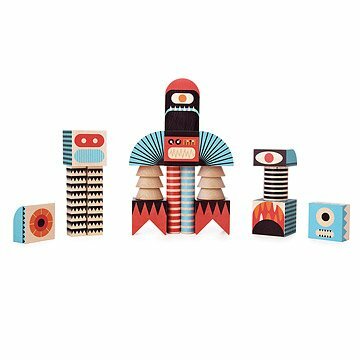 Stack and create your own wooden monsters with this set of mix and match blocks. Featuring a vibrant array of feet, hands, heads, and patterns, along with scalloped dowels to hold them together, these basswood blocks can unleash a multitude of quirky creatures that kids will be proud to call their own creations. Bold illustrations lend a touch of high design, so when the monsters have met their match and laying strewn about, you can call it modern art. Made in the USA. I purchased these blocks for my two year old's birthday. The design and colors are great, and the carved, recessed details on the blocks really speak to a higher level of quality and craftsmanship. I was hesitant about the price, which is rather expensive, but the unique designs and fact that the inks are non-toxic (teething toddler) helped to justify the expense. Each block face has a different design, so the possible number of monsters you can create are endless. We got this gift for our son's first birthday. He mostly chews on them and clanks them together, but we appreciate the design and quality of the blocks. My one complaint is that they simply stack and don't actually connect together. However, we knew what we were buying so overall the family loves them. I purchased this block set for my toddler son and we love it. It's a nice change compared to the alphabet or number blocks that are out there. Even though these blocks are more expensive than the average set, I thought it was worth the expense being that it was made in the USA, well- made, and has non-toxic paint.